A Prunus persica (L.) Batsch. cultivar. ‘Flowers small. Fruit middle-sized, rather more long than broad. Skin greenish yellow on the shaded side; but when exposed to the sun, of a dark red or purple colour. Flesh greenish yellow, melting and juicy, of a very excellent flavour, and separates from the stone. Ripe the beginning and middle of August.’ [George Lindley – Orchard Guide p.289/1831]. 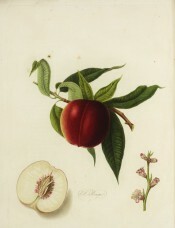 ‘This Nectarine [El Rouge] is said to have derived its name from that of Gourle, (being reversed); a nurseryman at Hogsden, or Hoxton, which is supposed to have raised it from seed, in the time of Charles the Second; and it does not appear to have been known to any foreign writer on this subject. It has also obtained the name of the Clermont Nectarine, out of compliment to Holles, Duke of Newcastle; in whose gardens at Clermont, it was brought to great perfection. Tree very free and vigorous in its growth, and an abundant bearer. Blossom very small, the petals narrow, hollowed like a cup or spoon, very similar to those of the Violet Nectarine, but rather paler coloured, and the filaments longer in proportion. Fruit good size, somewhat oblong, of a bright, handsome red towards the sun, and of a light yellow where not exposed to it. The separation of the red and yellow, in this variety, is distinct, and not so much shaded off as in others; flesh very white, with a little red next the stone. Of excellent flavour early, and a good forcer. Stone small, rather oblong, of a reddish brown; separates very clearly from the flesh when fully ripe.’ [PL vol.1, pl.1/1818]. Also figured in Le Jardin Fruitier du Muséum [JFM vol.7/1866] and Pomona Britannica [PB pl.XXXIV/1812]. 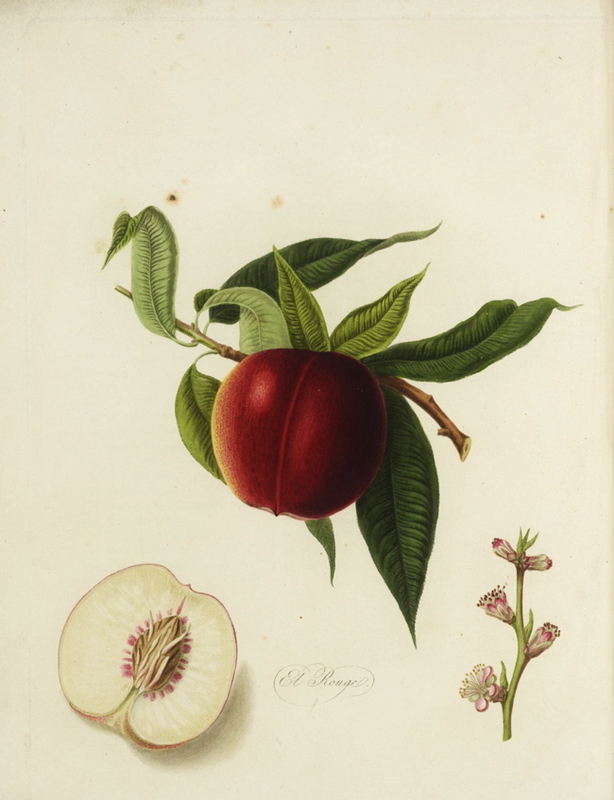 Listed as ‘Elruge Nectarine’ in all published catalogues [Peach no.10/1843].